Supreme Court Petition - Constitutional Income: Do You Have Any? 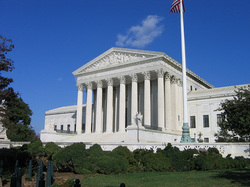 CDA man places tax question before the Supreme Court"Does the 16th Amendment provide Congress with an exception to the Constitution's apportionment clause regarding its authority to levy a direct tax? "COEUR D'ALENE, Idaho: Truth-in-Taxation proponent Phil Hart of Coeur d'Alene, Idaho filed a Petition for Writ of Certiorari with the U.S. Supreme Court June 21, 2002. (The Petition had been previously filed in April and was resubmitted in June with corrections and additional documents.) Hart, an engineer in his professional life, has dedicated the last six years to pursuing the truth about the income tax while exhausting his administrative remedies in pro per defense of an IRS tax collection case. Since 1996 Hart has made about a dozen trips to the Library of Congress and the Supreme Court's library Washington, D.C., and has visited seven other libraries. He has researched every Congressional Record entry and relevant Congressional documents from the period of time when the income tax amendment to the Constitution was being debated and ratified. He has also accumulated in his files an impressive body of newspaper articles, law and economic journal articles, books, essays and letters that capture the intent of the income tax from the first congressional debate in 1909 through the time it was implemented in 1913. The purpose of this area of research was to discover what the intent of the American People was when they lobbied Congress and their state legislatures for an income tax amendment to the Constitution. Hart believes an objective review of the record proves that wages are not income and that the 16th Amendment does not empower Congress to levy a new kind of tax not authorized by the Constitution. According to Hart, "The purpose of the 16th Amendment was to bring tax relief to wage earners." Much of the income tax debate has centered around the improper ratification of the 16th Amendment, whether or not wages are income and who is or is not liable for the tax. Hart believes the key question is, "Does the 16th Amendment provide Congress with an exception to the Constitution's apportionment clause regarding its authority to levy a direct tax?" Though this is arguably the most fundamental of income tax constitutionality questions, surprisingly, no one has framed the argument quite like this before. Since World War II, when patriotism swept the nation and Americans gladly paid the new "victory (income tax on wages) tax", thousands of income tax cases have been heard at the lower levels of the federal court system. But back in 1916, when the first few income tax cases came up to the Supreme Court, in at least five of these cases the parties were arguing that this "income tax exception" did exist such that a direct tax could be levied without apportionment. Correctly and in harmony with the other clauses of the Constitution, the Supreme Court said no. Unfortunately, this position of the Court was somewhat obscured by the complex writing of the Court in its opinion. When Hart read Supreme Court's entire file on these first few income tax cases, it became crystal clear as to the position of the Court on this question. Sadly, Hart is the first researcher in the Truth-in-Taxation movement to dig this deep into this area of research. But as time has gone by, the lower courts have been inconsistent with their decisions to the point today where total confusion exists regarding the income tax. Some courts say the income tax is a direct tax, whereas other courts say it is an indirect tax. It gets even worse, there are court rulings saying that the income tax is both direct and indirect, that it is neither or that the issue is irrelevant. Direct tax or indirect tax?At the time the Constitution was written in 1787, there were only two authorities upon which the framers relied for the terms "direct tax" and "indirect tax." These were Adam Smith, who wrote Wealth of Nations in 1776, and Frenchman Jaques Turgot author of Plan d'un memoire sur les impositions in 1764. Smith's Wealth of Nations states, "Capitation taxes, so far as they are levied upon the lower ranks of people, are direct taxes upon the wages of labour, and are attended with all the inconvenience of such taxes." The IRS has steadfastly maintained that an income tax on wages is a direct tax exempted from the Constitution's apportionment rule. But when Congress approved the 16th Amendment and sent it out to the states for ratification, four times the Senate rejected the opportunity to create this "apportionment rule exemption for income taxes." According to Hart, "The executive branch of government cannot do something that was not authorized by the legislative branch." Will the writ be heard?A Writ of Certiorari is, according to Black's Law Dictionary, 6th Edition, a "writ of review or inquiry." The Supreme Court rules are very specific as to the form of the filing. It must be presented as a booklet and must not exceed 30 pages. There are rules that govern the booklet's organization and dimensions, type style and size, margins, binding and content. Hart took special care that his writ would not be disqualified due to form. For the Supreme Court to choose this writ from the thousands it receives, the issue must be "ripe." Due to the activities of We the People Foundation and many other Truth-in-Taxation activists such as Irwin Schiff, Bill Benson, Joe Bannister and Larry Becraft, there is little doubt that the issue is "ripe." "I believe there is a very good chance that the Supreme Court will hear this writ because of the disarray of the lower courts and the increasing political activisism on the issue," said Don Harkins, editor of The Idaho Observer. According to Hart, "The questions presented are simple, logical, the historical evidence is solid and there is no wiggle room for the government." As to the reason the Supreme Court should hear the writ, the petition concludes, "The habit of government exceeding its authority in the collection of taxes is as old as history itself. All the milestones in the progress of liberty and self government for the Anglo-American people were proceeded by abusive taxation, civil unrest, sometimes civil war or revolution, culminating with memoralized documents whereby the Citizens compel the government to obey the law. In the process of framing our Constitution, that instrument would likely never have been ratified without the direct taxation compromise between the large states and the small states. The requirement of apportioning direct taxes among the several States is the only provision of the Constitution that appears twice in the document. It is this very provision that is today being abused by the Commissioner. This Court should grant Certiorari so that this question can finally be settled."